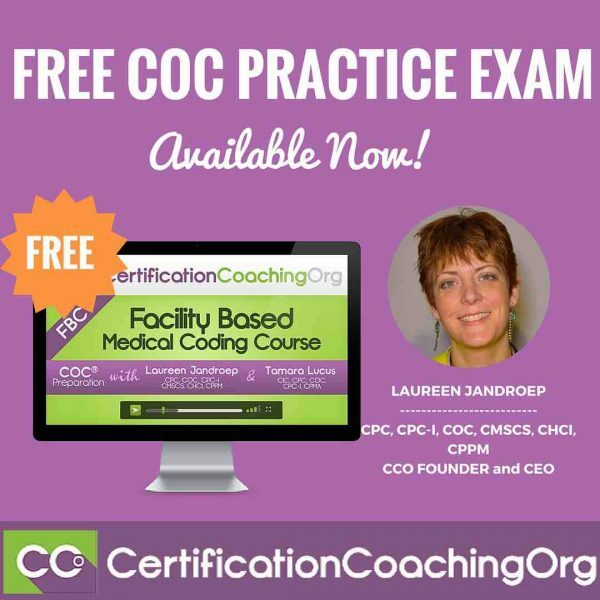 FREE COC Practice Exam from CCO — Download NOW! FREE COC Practice Exam – GET IT NOW! Laureen: This is where we wanted to announce that, thank you. Ruth Sheets, who is on our team, works very hard at creating our mock board exams. She‘s finished the first COC practice exam and the first one is free! So, if you’re working toward that credential, check it out; that will help you see if you’re prepared for the real exam. Where do you go? The links down here: http://go.cco.us/free-coc-online-practice-exam and Boyd put it in the chat, I was just going to ask, great. So, check that out and see how you do. Alicia: We have a lot of people that call in wanting to know what path to take and that’s one of the things we do is we tell them take one of the free practice exams. It’s like a test, a baseline for yourselves. This practice exam will help me to broaden my knowledge on the codes. 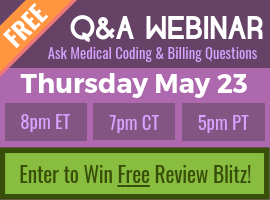 CPT codes, icd-10 and hcpcs codes. This is a little bit a challenging one for me if I really did a good coding upon referring to BLITZ sample coding exams. Hello! how much is the BLITZ?